We received Latin for Children Primer A for review from Classical Academic Press. All thoughts are my own. We've dabbled with Latin for several years in our homeschool. I want my daughters to learn Latin because it is the foundation of many languages, and it is unchanging. There aren't any new words being added to the Latin language nor are the use of pronouns and such being changed with the culture. Learning Latin, I believe, will be beneficial to my daughters. Even though I know the benefits of learning Latin, I am not fluent nor do I have a solid background in Latin, therefore, we need curriculum to help us move forward in learning the language. What is included in Latin for Children Primer A package? Primer A has been revised since we received our package, and is now printed in color and includes Roman paintings and images along with the new adventure story, Along the Appian Way. In our homeschool, each of my daughters has her own student workbook and activity book. 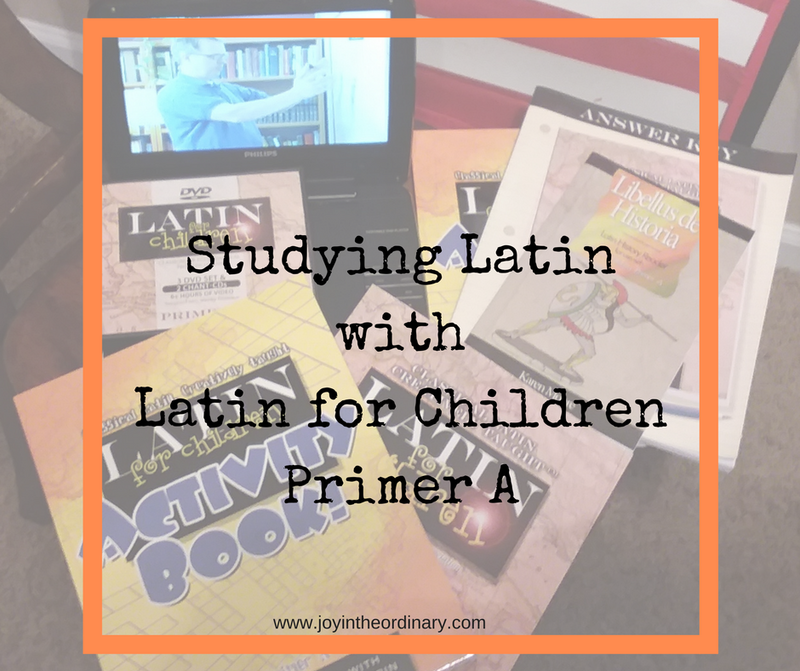 Latin for Children Primer A is written for students in grades 4-7. Students do not need prior Latin experience to use the program. My daughters are in grades 5 and 7, and Latin for Children has been a better fit than previous programs. The instruction is given via recorded video. We use the DVDS. Each lesson is introduced with a small group of children chanting the vocabulary, chant, and chapter maxim. I appreciate the use of regular children in the video because it shows that anyone can learn Latin not only the instructor. After the children chant, the instructor enters the frame ready to teach the day's lessons. The lessons aren't particularly long which is a great perk. It can be overwhelming if a lesson is packed with full with new information. I like the way the instructor hones in on the objective making the instruction clear and concise. The student primer includes background text, vocabulary, assignments, activities, and quizzes. Activities aren't limited to the student text. The activity book includes fun and engaging activities such as crossword puzzle, art projects, mazes, vocabulary games, and more. We begin new lessons by watching the video. I encourage my daughters to recite the chants with the children by following along in their text. I recite it too. ☺ After watching the video, my girls and I discuss the lesson and the new information presented. This is when they highlight important information in their text. My girls complete the worksheet pages in increments versus doing an entire page at a time. I want them to sit with the lessons a bit versus piling on too much information. I've learned when they haven't had time to grasp the vocabulary, it becomes harder to keep moving forward so we simply take our time. There are two worksheets, an activity page, and a quiz in the student work book. We generally stretch them out over week and include pages from the activity book too. Some lessons we spend more time with than others. There are 30 lessons in Latin for Children Primer A, and I am confident that we will complete it in one school year. We listen to the audio several times each week to help us with pronunciation. The audio is a recording of the vocabulary, chant, and chapter maxim. There is also the reader which is written in Latin. We read the reader aloud together and translate the Latin to English aloud. This is a fun way for us to become more fluent in Latin and build our confidence. We only have one copy of the reader; therefore, we also answer the comprehension questions aloud too. One of my favorite aspects about Latin for Children Primer A is the text included in the student workbook. I like this because it gives my daughters the opportunity to practice highlighting important information. It also makes it possible for them to look back at a lesson when they need help or forget the meaning of something. For instance if they have forgotten the difference between conjugations and declensions, they can simply flip to those lessons versus having to watch the video lesson again. The teaching information isn't limited to the teacher's guide which makes it possible for my daughters to help themselves better understand Latin. My daughters have their own reasons for liking the program. My seventh grader appreciates the short length of the videos and the amount of information provided. She better understands the instruction because the videos are clear and concise. My fifth grade daughter likes the variety of activities in between the student activity book and the student workbook. Latin for Children Primer A has been our answer for intentionally learning Latin together. I am glad it works well for both of my daughters and their different learning styles. Jul 1 Are We Still Using Jenny Phillips' Good and Beautiful Language Arts Curriculum?